Take yourself outside of the auto industry for a moment. The coffee shop I go to daily is out of my driving way, but I go there because they provide me with the best service and great tasting coffee. The nail place I get my nails done is not the cheapest place in town or the closest to my house but I go there because they do an excellent job in their services and give me personal attention. These are small purchases in my daily life. So imagine spending instead of $2 for a coffee, $15,000 for a car. Or perhaps I am shopping for an SUV, so now I am spending $30,000 on a vehicle. Who would you buy a car from? As Internet and BDC departments continue to grow with over 85% of buyers now doing research online, it is mandatory we must use this to our advantage. BRING VALUE to your first impression. Once upon a time, emails were cutting edge. Proper punctuation, maybe a signature at the bottom or company logo would catch the customers attention. 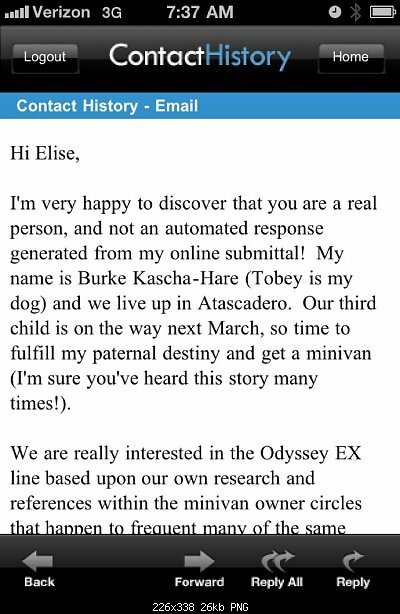 Now, with the CRM companies providing auto responders-many of these emails are close to or nearly the same. An email is nothing more than words on a screen. There is no audio, no tone inflection or any emotion. There is nothing in an email that can excite a customer except for maybe a low ball price. 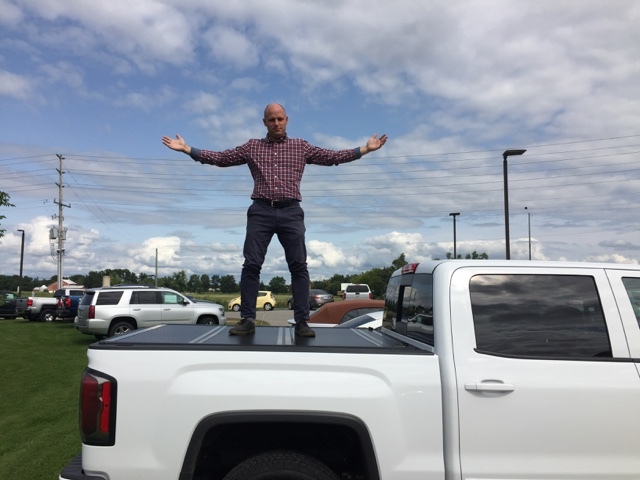 In an email we have the least control and many dealerships are forced under the perception that the only way to win an internet customer is to drop their pants and sell their product below invoice and give away holdback. I am here to tell you this is a broken method. 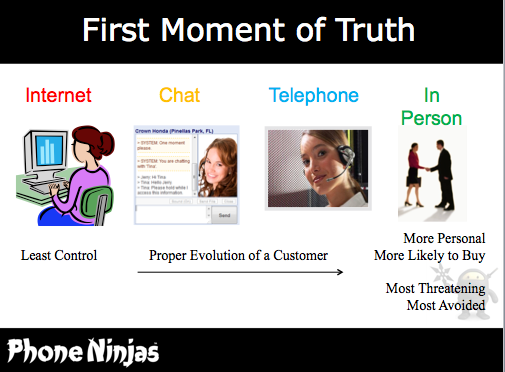 The evolution of a customer starts with the first moment of truth. 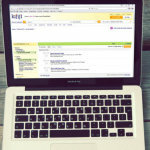 A customer is shopping online for a vehicle. The internet, a chat session or even a phone call will not gain a sale to your dealership. The customer still needs to come to the dealership. 86% of customers end up buying something different than what they originally inquired on, and the only way for a customer to make a purchase is to come to the dealership. As a customer however, they are taught to have an instinctual fear of Car Salespeople. Salespeople are stereotyped to be just as pleasant as sitting in a dentist chair. An email or even a phone call is much less personal to a customer to where they do not have to come in. However, our goal as a dealership is to get the customer in the store. How do we do this? The first moment of truth is where this process begins. Working in the internet department, we all face the same challenges. An invalid phone number and sometimes even a bogus name. A customer does this because of the fear they have of being bothered or pushed into a sale. 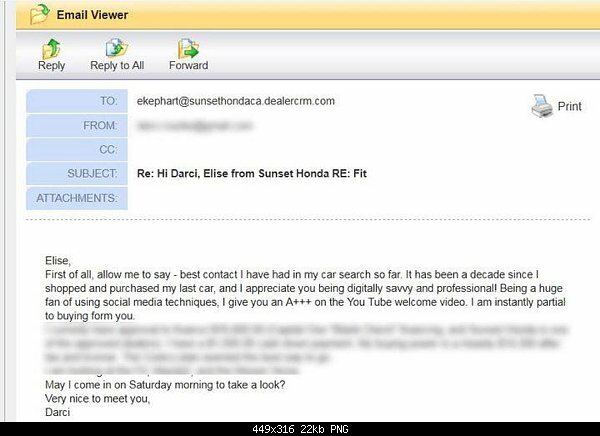 So imagine being a customer, submitting an internet request and you receive the same autoresponder from 15 dealers. Then, there is one email where instead of just words is a personalized video message. A video message that is simple and short. 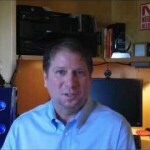 A video with a face, a voice and introductory of the salesperson and their genuinality in serving your needs. Working at Sunset Honda, this was the process that I did to bring the customer into the store. The result for me was not only a huge cliental basis but responses from customers like below. 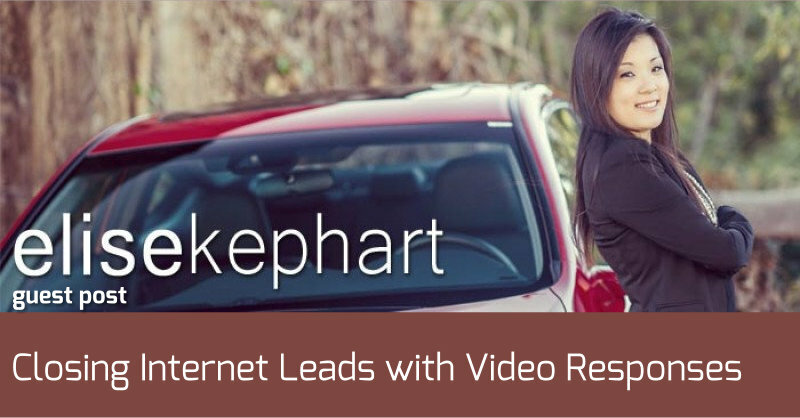 The result for me closed 20% of my internet leads. And not just a high closing ratio, but a loyal customer basis who would drive four hours JUST to buy from me. A dealership in LA or San Jose (both 4 hours from Sunset Honda, San Luis Obispo) would send low ball quotes below invoice but this ultimately was not want the customer wanted. My customers wanted exactly what I preached-a relationship and a person who cared for their needs and would be there for them the entire process. Nothing better than a video message with visuals and tone would create this first moment of truth. Customers want a valuable salesperson who is above the stereotype. They want someone who will assist them in their entire purchase and future purchases. They want someone they like and trust. It goes back to the same reason on why I drive out of my way to go to a certain coffee shop, or why I pay more to go to a certain nail shop. The common response after seeing these videos is time efficiency. The veterans in the business are convinced that this takes too much time. The average salesperson will complain that it will take too much time to send a video-and then at the end of the month they have 8 cars out. The truth to this however is that times are changing and we need to evolve with it-otherwise your competition will and your customers will buy outside of their local market to purchase from the salesperson who brings them the most value. The video greetings I sent took me five minutes to make. The hardest part of course was learning the software to edit them. This however is just like any other task we must learn in our business such as it was when the internet first came around and we had to learn how to write and send an email, or how to upload a photo. Is your internet department getting feedback like this? Bring your customers into the dealership to sell the car. Be the dealership or salesperson that will create the highest first impression to get your customer to trust and like you.